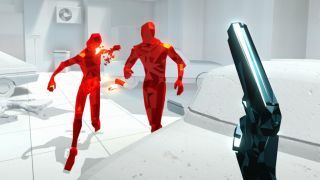 Superhot, everybody's favourite time-wrangling, bullet-dodging puzzle-gunner will finally get its expanded release on February 25. From humble origins in the 7dFPS competition, Superhot took tired and overused bullet time mechanics to their extreme—time only moves when you move. Stand still. Take a deep breath. Think. Fire. It busted through Steam Greenlight with the promise of an expanded version and raised $100,000 on Kickstarter in under 24 hours, pledging new features like Replay mode in which you can watch your run back in real time (featured in that fancy trailer, I'll wager). Superhot is a hard concept to wrap your head around. Luckily, there's still a free prototype to try out.